We headed up to Bảo Đài Mountain, also known as Vảy Rồng Mountain, to visit the Ngọa Vân Am (Ngọa Vân Pagoda) historical site. The site, located in the Yên Tử historical complex in the northern province of Quảng Ninh, is where King Trần Nhân Tông (1258-1308) practised Buddhist Zen during the final years of his life. The Ngọa Vân Pagoda is one of among 14 historical sites dating back to the Trần dynasty (1225-1400), located in An Sinh and Bình Khê communes, Đông Triều District in Quảng Ninh. Looking up at the high mountain, a difficult-to-express feeling emerged inside me. The holy mountain should have been deserted with wild trees. With a strong will and his spiritual enlightenment, King Trần Nhân Tông left the imperial citadel to lead a monk’s life in Yên Tử and establish the Trúc Lâm Yên Tử Zen Sect. Trúc Lâm Yên Tử, or simply Trúc Lâm (Bamboo Grove), is the only native school for Buddhism in Việt Nam. Trần Nhân Tông was a wise emperor in Đại Việt State at the end of 13th century. He made many contributions in protecting the country, with two victories over Yuan-Mongol invaders (in 1285 and 1288), as well as developing the national economy and culture, and coordinating sophisticated diplomacy. In addition to the principle that Buddhism and life are never separate, Buddhism under the Trần dynasty also gave prominence to promoting altruism through helping people delve into their cognitive thinking. Believing that everyone has a Buddha nature inside them, King Trần Nhân Tông encouraged people to self-improve, keep away from inhuman activities, turn to charitable deeds and be masters of their lives. By so doing, the King claimed, people would be able to live lives of Nirvana, an enlightened state in which the fires of greed, hatred and ignorance have been quenched. Previously, there have been various opinions about the location of the Ngọa Vân Pagoda. But according to archaeologist Nguyễn Văn Anh, from the Việt Nam Institute of Archaeology, research results provided scientific evidence that the Ngọa Vân Pagoda in Tây Sơn Village, Bình Khê Commune, was where King Trần Nhân Tông led a monk’s life. 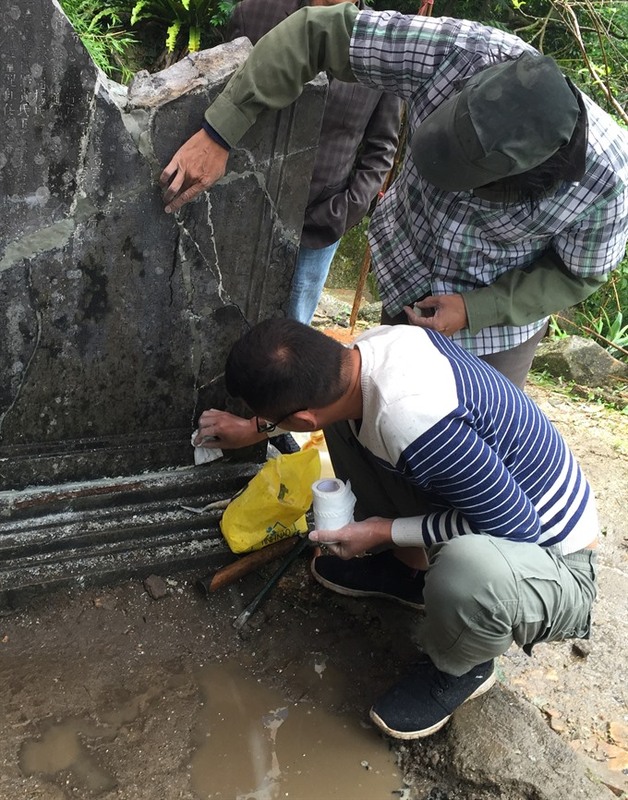 At six locations, stretching from the east to the south side of Ngọa Vân Mountain, including today’s Ngọa Vân Pagoda area, artifacts have been found dating back to various times, which proved that the Ngọa Vân historic site was where the King died, as recorded in history. Ngọa Vân Tự means “Pagoda on the Clouds”. At 500m above sea level, the pagoda has beautiful views, as it is seen resting on the cloud covered Ngọa Vân Mountain Peak, with two mountain ranges seen on two sides, looking over a small mountain, and further into a valley with the Cầm River curving around. The pagoda was built under the Trần reign, and was added to during the Hậu Lê reign (1427-1789). The pagoda consists of three layers, with Am Ngọa Vân (Ngọa Vân Pagoda) as the highest building, and an altar inside displaying a copper statue of King Trần Nhân Tông in a reclining posture. The Ngọa Vân Pagoda has been upgraded into a spacious historical site, with a main pagoda, the small Ngọa Vân Pagoda on top, the Buddhist King Tower, which some historic documents say contains some of King Trần Nhân Tông’s sariras, along with the small pearl found after burning corpses of veteran Buddhist monks. Ancient stones at the historical site have been well preserved. 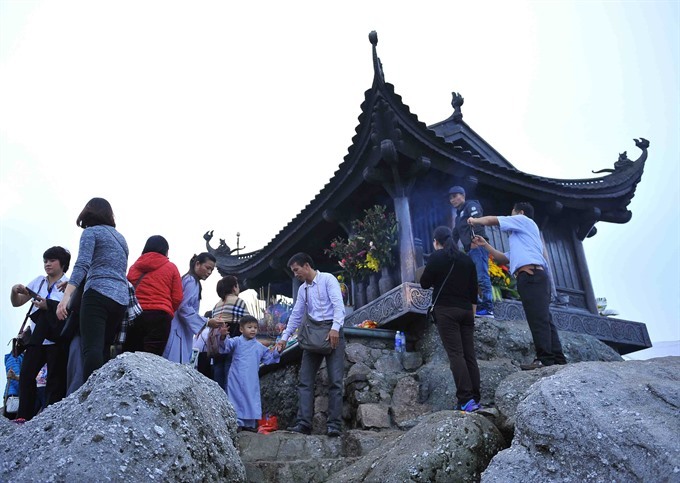 The pagoda, located in a popular complex of landscape and historical sites on the Yên Tử Mountain Range, stretches throughout the three provinces of Quảng Ninh, Bắc Giang and Hải Dương. The mountain range’s highest peak is Yên Tử, which rises to 1.068m above sea level. The site not only offers a naturally beautiful landscape, but hosts rare flora and fauna. The Yên Tử Spring Festival begins each year on the 10th day of the first lunar month, which falls on February 25 this year, and lasts for three months. 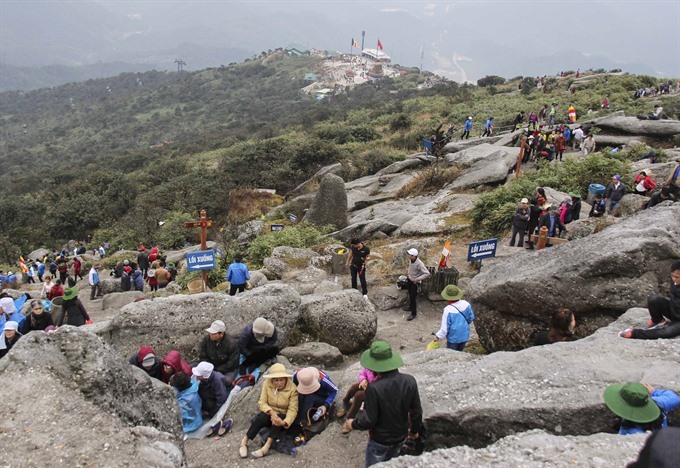 Tens of thousands of pilgrims begin their journeys to the uppermost shrine, after performing a solemn ritual at the base of Yên Tử Mountain. During the months of the festival, people flock from all over the country to the Buddhist land to express their devotion and wishes, or to rid themselves of anxiety and sadness. Others go to Yên Tử for sightseeing and to enjoy the pure, clean air of the mountain region. Foreigners visit Yên Tử to see the famous and mysterious tourist attraction and natural beauty. Among the wide variety of sites in Yên Tử, there are 11 pagodas and hundreds of shrines and towers. 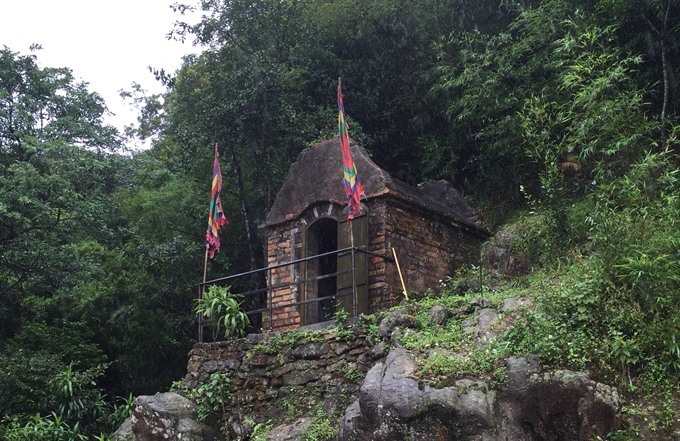 Pilgrims climb the mountain on a path through the forest to see the Đồng (Copper) Pagoda at the peak, located 1,068m above sea level, passing by pagodas, a tower, and a stream that appears and disappears under thick foliage. On a clear day, one can nearly see the entire northeastern area from here. The pilgrimage route from the foot of the mountain to the pagoda is nearly 30km long, however, visitors can reach the Hoa Yên Pagoda at 534m above sea level by cable cars to see two beautiful 700-year-old frangipani trees. From there, visitors can feel they are walking on clouds as they walk the stairs to minor pagodas along the path leading to the Đồng Pagoda.